Today is the 100th anniversary of the arrival of the SS Talune in Western Samoa. This single ship spread the influenza pandemic from NZ to Western Samoa, Tonga, and Fiji. Thanks to the Rt Hon Helen Clark, there has been an official apology to Samoa for NZ’s negligent role in this disaster. In this blog we reflect on this event and consider NZ’s current responsibilities in helping its Pacific neighbours with infectious disease surveillance and pandemic control. More specifically, the Talune arrived in Apia, Western Samoa (modern day Samoa), on 7 November 1918 (100 years ago today of this blog being published). The NZ colonial authorities in Apia failed to appropriately consider the risks of having sick people on board and the Talune was given a clean “bill of health”. The results of the subsequent pandemic spread were truly disastrous with around 8500 people in Western Samoa dying, 22% of the population according to the “Report of the Samoan Epidemic Commission” . The high proportions of deaths among young adults and amongst leaders would have meant a very long-term impact on the country’s development. This disaster was in very stark contrast to the maritime quarantine applied to American Samoa – which successfully kept out the pandemic and had no deaths from it (see Figure below). Indeed, to make matters worse, the NZ Administrator of Samoa, Colonel Robert Logan, “did not accept from the Governor of American Samoa an offer of assistance that may have reduced the heavy death toll” . The Talune also spread the pandemic to Fiji and Tonga as detailed in a recent University of Otago PhD thesis . Is there still a risk of future pandemics? There remains an important ongoing risk of future influenza pandemics. Indeed, despite some improved control of “wet markets” , there is some evidence of increased emergence of new avian influenza strains in recent years . There is also the risk of pandemics from other novel natural diseases (as per SARS) as well as the risk of agents associated with bioterrorism exists, with some potential for spread to NZ . Advances in synthetic biology, such as new gene editing tools (notably clustered regularly interspaced short palindromic repeats / CRISPR), raise concerns about the potential for production of novel pathogens which could be released accidentally or deliberately as bioterrorist weapons . What should the NZ Government be doing to advance regional pandemic control now? We think that to more fully address the historical harms, it would be desirable if the NZ Government extended official apologies to Fiji and Tonga – given how the Talune also spread the pandemic to these countries. But one area where the NZ pandemic plan needs particular development is in providing mechanisms for rapid border closure for severe pandemics (see these two studies done for NZ that consider the costs and benefits of border closure:  ). There is also probably the need for new emergency laws in NZ to facilitate rapid border closure when needed. Such laws should ensure the Prime Minister and Cabinet are protected from legal action and that key industries such as tourism can potentially be compensated financially to speed their post-disaster recovery (or that these industries be required to have adequate insurance cover). Offering to help upgrade pandemic plans and running training exercises for operationalising them in Pacific nations. Border closure might be a particularly worthwhile option in a severe pandemic for such nations. It could be complete closure, or for small islands it could be combined with quarantine . Major travel restrictions, albeit still allowing for some travellers, could also potentially work for some Pacific nations with small travel volumes . Offering to strengthen regional infectious disease control and surveillance systems covering the Pacific (potentially with more liaison with the Pacific Community and the World Health Organization). The recent Australian investment in the centre for Health Security (AU$ 300 million) is a worthy example that might be reasonably matched to some extent by NZ. These countries could specifically offer more support to Pacific nations to allow them to meet their obligations under the International Health Regulations 2005. Targeting development assistance to reduce risk factors for death during pandemics eg, particularly by reducing poverty and strategies to reduce household crowding in Pacific nations (eg, support for family planning and improved housing). Similarly, for supporting ways to prevent chronic diseases which are also risk factors for death in pandemics (eg, via supporting tobacco control and improvements to the food supply). In summary, the 100th anniversary of the 1918 influenza pandemic is a valuable reminder about the persisting threat of pandemics. While it is helpful that the NZ Government has officially apologised for some of its mistakes in the South Pacific in 1918, it still has scope to upgrade its regional role in supporting prevention of future pandemics in this region, along with wider improvements to public health and health services. Shanks GD, Wilson N, Kippen R, Brundage JF. The unusually diverse mortality patterns in the Pacific region during the 1918-21 influenza pandemic: reflections at the pandemic’s centenary. Lancet Infect Dis. 2018. Elliot G, Wilson T, Moorhouse W: Report of the Samoan Epidemic Commission. In. Wellington, New Zealand: Government of New Zealand; 1919. Ministry for Culture and Heritage. Influenza hits Samoa. Ministry for Culture and Heritage. (Updated 26 July 2018). 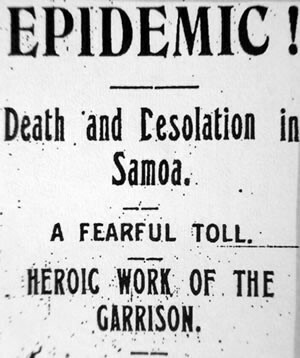 URL: https://nzhistory.govt.nz/media/photo/influenza-pandemic-hits-samoa. Clark H. Full text: Helen Clark’s apology to Samoa. NZ Herald 2002;(4 June). https://www.nzherald.co.nz/nz/news/article.cfm?c_id=1&objectid=2044857. McLeod MA, Baker M, Wilson N, Kelly H, Kiedrzynski T, Kool JL. 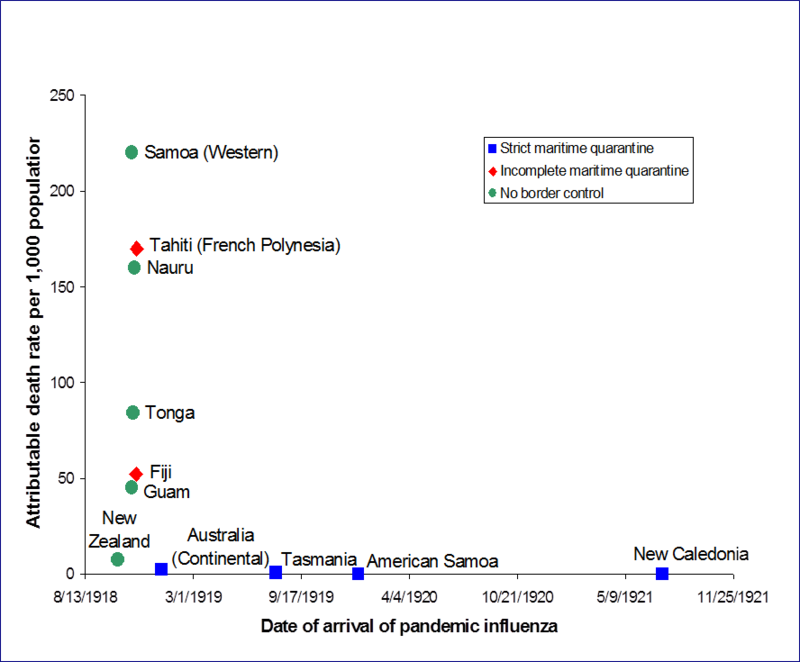 Protective effect of maritime quarantine in South Pacific jurisdictions, 1918-19 influenza pandemic. Emerg Infect Dis. 2008;14(3):468-470. McLane J. Setting a Barricade against the East Wind: Western Polynesia and the 1918 Influenza Pandemic. [PhD Thesis]. Dunedin: University of Otago, 2012. Yuan J, Tang X, Yang Z, Wang M, Zheng B. Enhanced disinfection and regular closure of wet markets reduced the risk of avian influenza A virus transmission. Clin Infect Dis. 2014;58(7):1037-1038. Bui CM, Chughtai AA, Adam DC, MacIntyre CR. An overview of the epidemiology and emergence of influenza A infection in humans over time. Arch Public Health. 2017;75:15. Wilson N, Lush D. Bioterrorism in the Northern Hemisphere and potential impact on New Zealand. N Z Med J. 2002;115(1154):247-251. MacIntyre C, Engells T, Scotch M, Heslop D, Gumel A, Poste G et al. Converging and emerging threats to health security. Environment Systems and Decisions. 2018;38:198–207. Boyd M, Baker MG, Mansoor OD, Kvizhinadze G, Wilson N. Protecting an island nation from extreme pandemic threats: Proof-of-concept around border closure as an intervention. PLoS One. 2017;12(6):e0178732. Boyd M, Mansoor O, Baker M, Wilson N. Economic evaluation of border closure for a generic severe pandemic threat using New Zealand Treasury methods. Aust N Z J Public Health. 2018;(8 August). Nishiura H, Wilson N, Baker MG. Quarantine for pandemic influenza control at the borders of small island nations. BMC Infect Dis. 2009;9:27. Eichner M, Schwehm M, Wilson N, Baker MG. Small islands and pandemic influenza: potential benefits and limitations of travel volume reduction as a border control measure. BMC Infect Dis. 2009;9:160. This entry was posted in Uncategorized and tagged 1918 influenza pandemic, colonisation, Pacific health, pandemic planning by dayhi34p. Bookmark the permalink.